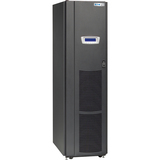 The SV40KL SmartOnline® SV Series 40kVA 3-Phase On-Line Double-Conversion UPS System delivers true scalability and offers the highest level of secure, uninterrupted power protection. 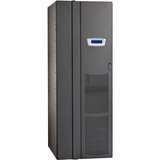 Featuring a modular, scalable design with high-efficiency voltage and frequency independent (VFI) operation, this on-line UPS system is ideal for protecting a variety of critical IT systems. The SV40KL includes preinstalled input, bypass and output breakers, as well as a static transfer switch (STS) and two included 20kVA SV20PM power modules. Space is included for up to six additional user-installable SV20PM power modules to accommodate increased capacity up to 140kVA with N+1 fault tolerance. 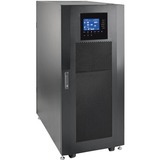 Each power module is rated at 0.9 power factor for maximum power to the connected load. 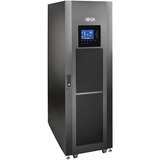 With up to 92% efficiency in standard mode and up to 99% efficiency in optional economy mode, this 40kVA UPS system helps you reduce operating and cooling costs. Automatic and manual bypass options keep connected equipment operational during routine maintenance or critical power module failure. Batteries are not included. External ±120VDC battery cabinets, such as Tripp Lite's BP240V370, are sold separately.